Morgan and Ainsley Ochoa sled at the base of Steamboat Ski Area on Tuesday afternoon as mountain crews make final preparations for Scholarship Day. The ski area is opening 655 acres, which encompasses 22 percent of the ski area's terrain. Steamboat Springs — Editor’s note: This story has been corrected to reflect this will be the second largest amount of terrain the ski area has opened within the past five years. 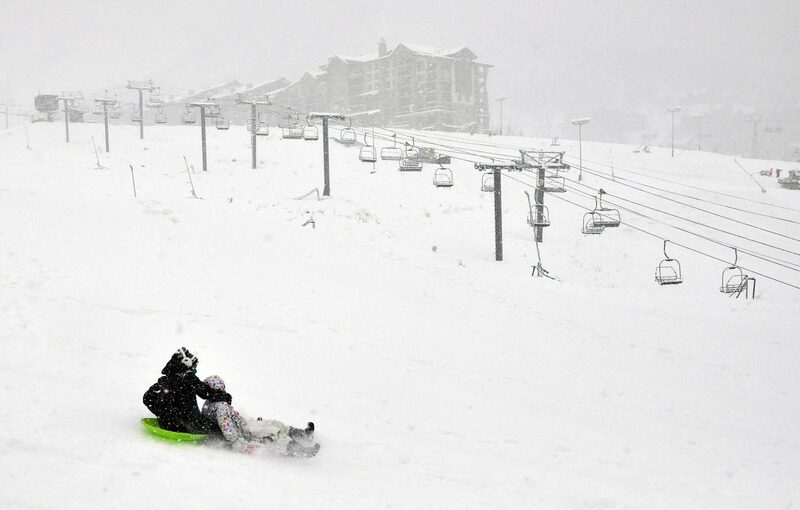 Powder should be aplenty Wednesday morning when Steamboat Ski Area opens for the 2014-15 season. The ski area plans to open 655 acres, which encompasses 22 percent of the ski area’s terrain. It will be the second-largest amount of terrain the ski area has opened within the past five years. Last year, the ski area opened with 735 acres of terrain. Wednesday is Scholarship Day, which is a fundraiser for the Steamboat Springs Winter Sports Club. Season passes cannot be used until Thursday. Lift tickets for Scholarship Day are $30 or $20 for skiers who just want access to the lower mountain. On Tuesday, Scholarship Day was shaping up to be a true powder day. Heavy snow was falling and local meteorologist Mike Weissbluth, with http://www.snowalarm.com, was predicting 8 to 16 inches of fresh snow on the mountain by Wednesday morning. Lifts operating on Scholarship Day will include Christie Peak Express, the gondola, Storm Peak Express, Burgess Creek and Four Points. A significant portion of the upper mountain will be open from Buddy’s Run to High Noon. For tree skiing, anticipated open trails include the upper portions of Shadows, Closets and Twilight as well as One, Two and Three O’Clock trails down to Duster. A large number of trails off the Four Points and Burgess Creek lifts also will be open. By Friday or Saturday, the ski area plans to open Big Meadow, Flying Z, lower Buddy’s Run, Tornado Lane, BC Ski Way, Why Not and Preview Lift. The ski area has been helped by good snowmaking weather. According to the ski area, snowmakers have produced more than double the usual amount of snow for this time of year and recently surpassed the 50 million gallon mark. The ski area also has benefited from abundant natural snowfall. In the past month, the ski area reported receiving 4.3 feet of snow. On Tuesday, they received 2 feet of snow in the past 72 hours at Thunderhead. Currently, there is a 30-inch snow base at midmountain and a 36-inch base at the summit. Lifts begin running at 8:30 a.m.